Radiator Blog: Frontiers, and why I'm afraid of working with multiplayer. Frontiers, and why I'm afraid of working with multiplayer. 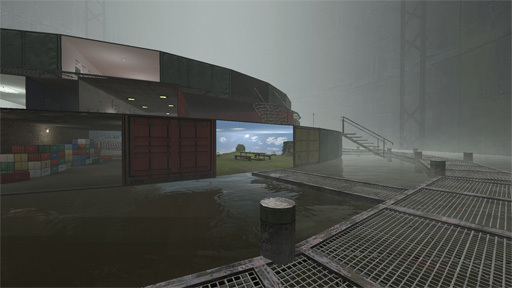 Frontiers is a multiplayer Half-Life 2 mod where one team is border guards and the other team is refugees, with environments and visuals based on real-life diaspora. The concept is very compelling... but I'll never get to play it, since it's real-time multiplayer and relies on a live, sustained player base that it'll never have. This is why "serious games" and messaged-based games, in my mind, should never require more than a handful of players (or ideally, 1 or 2) to deliver its rhetoric -- or they should use asynchronous multiplayer -- because this is how a game dies. In contrast, single player games live forever. I don't want to say, "don't make real-time multiplayer games," because that sounds awful. But I guess I'm saying it. I don't see any way around it.